I want… Buy me… Please! Please! Pleeeeeze! We knew this day was coming and this week it has arrived. Logan is 4.5 years old and has “discovered” why they put commercials on TV. Until now when we were watching a show and a commercial came on he would ignore it because it was not as interesting as Curious George or Zulu Patrol. I know this is not a new phenomenon to other parents or unique to us, but it seems that way. We are trying to stop this behavior early so it does not snowball as he gets older. We explain that he really does not need this and that he has plenty of toys in his room. Ultimately it comes down to the art-of-distraction. Can we get him to focus on something else before he becomes fixated? Here are some of the more annoying ads. Cuddle-Uppets ($19.99) - Blankets that are puppets. Wow! What more could a kid want? Moon Sand ($19.99) aka Moon Dough, Magic Sand, Aqua Sand - The amazing new Dough that is out of this world! Bendaroos ($17.95) Amazing Flexible Building Stick! 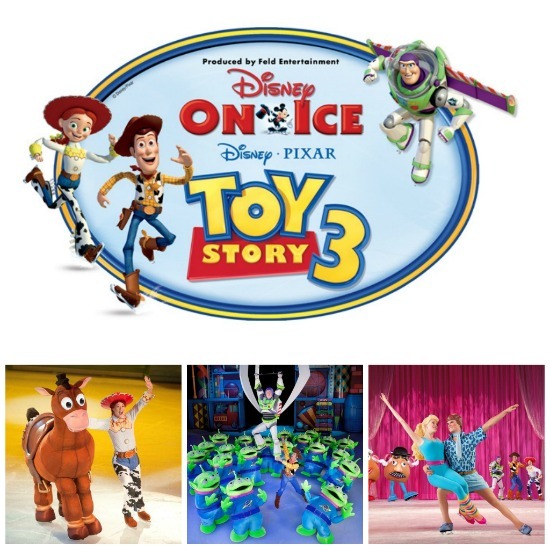 Disney On Ice - Toy Story 3 ($45.00) Yes, we are going to see this the 2nd week in March and looking forward to it.